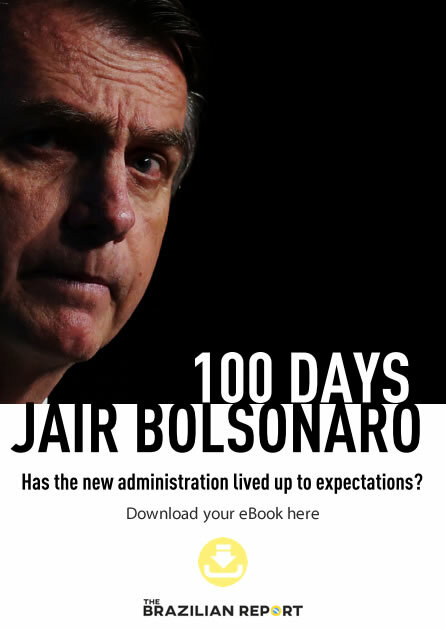 Upon alighting the plane in the U.S. capital earlier this month, Jair Bolsonaro proudly declared that “for the first time in a long time, a Brazilian president who is not anti-American arrives in Washington.” While Mr. Bolsonaro’s statement overplayed the so-called “anti-Americanism” of previous presidents, it is a fact that Brazil and the U.S. have never been closer on political terms. 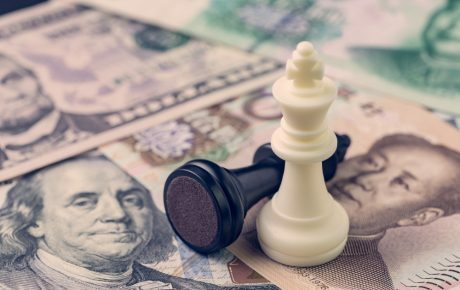 Besides the financial and political effects of such a relationship, there is also the question of what the Brazilian public thinks about this proximity. 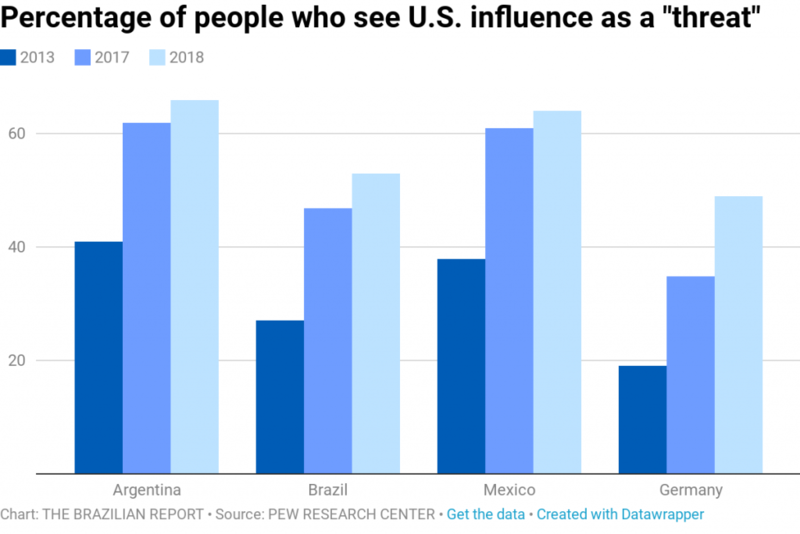 A recent Pew Research Center study polled residents from 22 nations around the world, asking them what they thought of the United States’ influence on their respective countries. In Brazil, 53 percent of respondents stated the U.S.’s power represented a major threat to their nation. This figure is all the more telling when compared to the same study carried out in 2013, when only 27 percent of Brazilians expressed such a concern about the United States. Furthermore, the rate appears to still be rising, jumping six points in the last year. 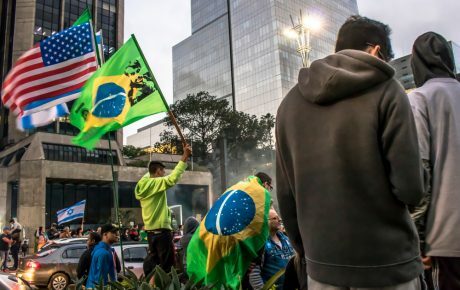 The study asked the same question about the influence of China and Russia, but found much lower results among Brazilians, with only 43 percent regarding each country a threat. In recent decades, Brazil’s official relationship with the United States has been distant yet cordial. Presidents Fernando Henrique Cardoso and Luiz Inácio Lula da Silva got on very well with Bill Clinton and George W. Bush, respectively, but problems began to arise in the 2010s. Under Workers’ Party governments, Brazil was close to countries such as Venezuela and Cuba, drawing the suspicion of Washington. 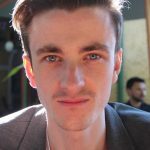 The wariness went in the other direction, too, when in 2013 it was revealed that President Dilma Rousseff was being spied on by the U.S. National Security Agency. Trade-wise, instead of curving to the U.S.’s wishes and acting as a “useful” buffer to the growing influence of China, Brazil preferred to snuggle up to Beijing, with the East Asian giant quickly becoming the country’s biggest trade partner. Besides this, U.S. involvement in Brazil was relatively low and locals saw little reason to regard Washington’s influence as a real and present threat to their sovereignty. This appears to have changed in recent years, thanks to the elections of both Donald Trump and Jair Bolsonaro. The Pew Research Center report shows that increased distrust of the U.S. with a Donald Trump presidency is not a trend exclusive to Brazil. In the 22 countries studied, the perception of a threat from U.S. influence has increased an average of 20 percent in the last five years, and seven percent in the space of one year. In Germany, for instance, suspicion of the United States stands at 49 percent. In 2013, it was only 19 percent. The effect of Jair Bolsonaro is also a relevant point when we look at Brazil’s numbers in this study. The six percentage point jump in mistrust over the last year was accompanied by Mr. Bolsonaro’s electoral campaign, in which he defended full alignment with the U.S. and favoring Washington as a trading partner over China. Since his election, the country’s diplomacy has become something of a U.S. fan club. 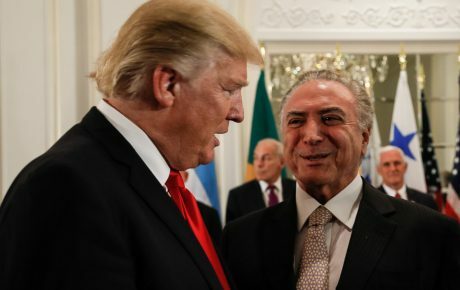 The leading figures in Brazil’s foreign policy—Chancellor Ernesto Araújo, the president’s son Eduardo Bolsonaro, and ideological savant Olavo de Carvalho—are all big fans of Mr. Trump, and depict him as a valiant warrior in the fight against globalization. 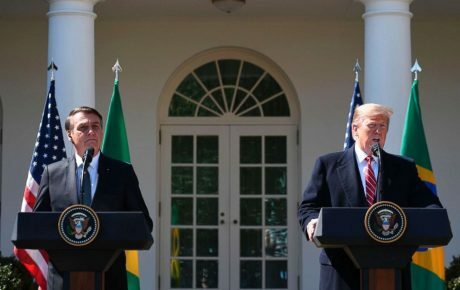 Breaking with tradition, Jair Bolsonaro chose the United States for his first official state visit (Brazilian presidents normally travel to Argentina at the beginning of their terms). Whilst there, he made a number of concessions to the Trump administration as a gesture of good faith and a symbol of his wish to establish closer ties between Washington and Brasilia. A technology safeguards agreement (TSA), decades in the making, was finally decided upon, allowing U.S. rockets to launch from Brazil’s Alcântara Launch Center. Jair Bolsonaro also issued a decree lifting tourist visa requirements for United States citizens, without any guarantee (or likelihood) that Donald Trump would reciprocate. During Mr. Bolsonaro’s visit, a public opinion poll asked Brazilians about the visa exemptions for U.S. citizens, to which 72 percent replied that it would only be fair for Brazil to receive the same benefit in return.